In a slight change of pace for once on Film Feeder, we’re taking a look at a direct-to-video release that will have most likely slipped off the radar but does deserve to be seen by some kind of audience. For this special occasion, we’re taking a look at The Last Survivors (aka The Well), the directorial debut of production designer Thomas S. Hammock which tells the story of a post-apocalyptic future where rain hasn’t fallen for at least a decade, and water is a resource that most would kill to have. One of the many residents of this wasteland is teenager Kendal, played by relative newcomer Haley Lu Richardson, who along with sickly companion Dean (Booboo “for the last time, I don’t personally know Yogi Bear” Stewart) protects one of the last remaining water wells from greedy savages including the dastardly Carson (Jon Gries) and his pack of cronies including his indulged daughter Brooke (Fox). Before you start asking where and how Mad Max comes into all of this, you should know that the film has many admirable qualities to help it stand competently on its own. Hammock’s experiences of being a production designer on films like 2014’s The Guest (incidentally, that film’s director Adam Wingard is credited here as a co-editor) has clearly given him an overwhelming appreciation of practical effects and sets, both of which are very impressively handled and give the film a genuine feel to the tension and action because we know for a fact that it’s all really there. CGI is used to the barest minimum here, and for a fairly low-budget film it looks very impressive with its simplistic but characteristic sets and backdrops. Don’t expect action right from the very start, however; it’s very much a slow-burner, and it does take a while for the movie to finally get into action but even then it’s never truly dull. Once in a while, you get a few repetitive scenes such as any conversation between Kendal and Dean or whenever Gries’ loathsome baddie attempts to justify his evil actions, but you’re so drawn into this world and environment – bare bones as it is – that you’re easily distracted to really notice. Once it does finally begin to focus more on the action, including one awesome katana sword which is so cool it doesn’t matter about where the hell she even found it, the film starts to truly shine. Richardson, a relative newcomer, easily stands out in what is basically her first major lead role, and though she’s not playing the most interesting character it’s certainly an admirable one in how strengthened she is and how much weight she has to carry on her shoulders, whether it’s protecting the water well or caring for Dean whose kidneys are slowly failing him thanks to the constant dehydration or more or less fending for herself on her own in the middle of the desert (her parents are nowhere to be seen, presumably they perished a while ago). While Kendal is not exactly on the same wavelength as Ellen Ripley or Katniss Everdeen, she’s still a fine character to root for and care about as the movie goes on; when she’s knocked out or attacked by hidden assailants, you’re truly on edge and hoping they actually don’t get to her, which is definitely the signs of a good performance that at the very least makes you care. However, not all of it is perfect and it does sometimes suffer from some of the usual notable mistakes of a first-time director. The pacing can be a tad too slow at times, and even though it can be used to establish an effective atmosphere it has the ability to drag for far longer than it needs to. In addition, while the cinematography is overall very nice, there are some scenes where it can damage the overall impact; there’s a scene set in an abandoned house nearer the start of the movie that’s shot in almost complete darkness, with little to no light provided for us to see clearly what is actually happening. It’s impossible to watch even with all the curtains shut at night-time, but thankfully this is the only scene that is shot this incomprehensibly. Though it may not be perfect and a far cry from the true essential direct-to-video movies also out there, The Last Survivors/The Well is fine enough entertainment for anyone who wants a chilled, serviceable flick to put on after a long day’s work. The Last Survivors/The Well is an impressive-looking film that favours practical effects over CGI and features a stand-out lead performance by Haley Lu Richardson, and although it suffers from a few problems it’s a fairly decent debut from director Thomas S. Hammock. LIKE WHAT YOU’VE READ? WELL, NOW YOU CAN WIN IT! 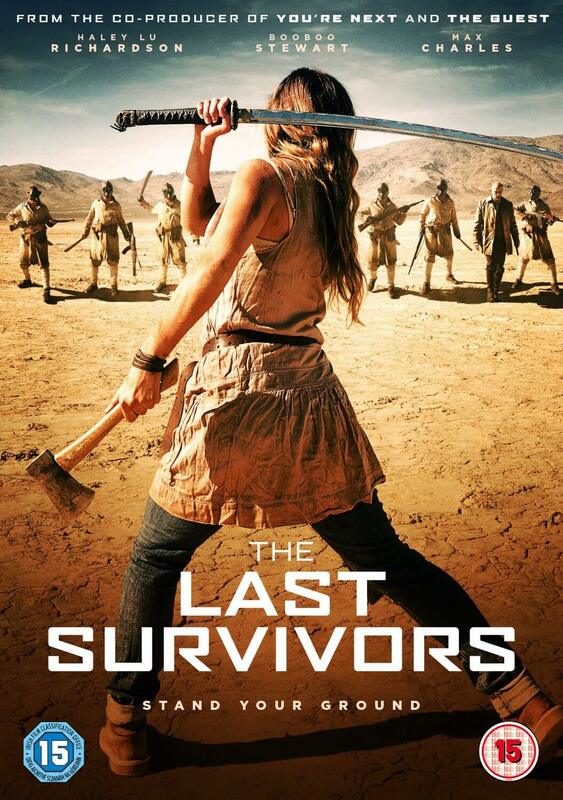 The Last Survivors director Thomas S. Hammock previously worked as a production designer on what 2014 film? Please send your answer, name and e-mail to jack@filmfeeder.co.uk, and the lucky winner (chosen at random) will be notified on Monday 18th May. Best of luck!